According to a recent Capcom stream, the remake of Resident Evil 2 is going to have some interesting free post-launch DLC. They’ve announced that they’ll be bringing out a special mode, The Ghost Survivors, which will feature never-before playable characters. Plus, you’ll get classic skins for Leon and Claire. If you want them to look like they did in the original Resident Evil 2. First of, let’s cover the two skins. These will be Leon ’98 (see the image above) and Claire ’98. According to Siliconera, who reported on the event, the initial way to get these skins is “buying specially marked PlayStation Store point cards in Japan.” However, starting March 22nd, the skins will launch as free DLC for everybody that owns the game. As for what the skins are, well, you can likely guess what they’re all about. 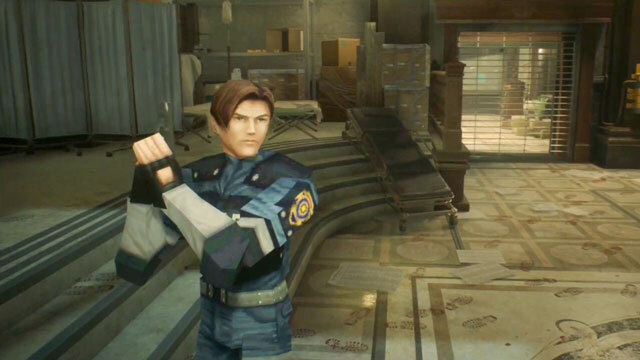 They turn Leon and Claire into their charming low-poly selves from twenty years ago, when the original Rezzie 2 launched. As for the new mode, The Ghost Survivors, that’s still kinda fuzzy. Apparently, it’s going to be episodic, and feature characters we’ve never been able to play as characters that have never been playable before. For example, there’s Robert Kendo, the owner of the Kendo Gun Shop in Raccoon City, and the daughter of Raccoon City’s mayor Michael Warren, Katherine Warren. Apparently, The Ghost Survivors will be random in some way, and there’ll be points that you can earn to purchase in-game items and weapons. I assume it’ll be some kind of rogue-like thing. Like, you battle monsters, earn points to buy better gear, then go in again and push further. The remake of Resident Evil 2 is coming out in just a few days; on Friday, January 25th. If you want to pick it up, you can do so on PlayStation 4, PC, and Xbox One. Based solely on the one-and-done demo, I’d say it’s very much worth giving a shot. Just keep in mind that it can get pretty tough, so don’t just waltz in expecting a cake-walk.